Located in a beautiful part of Somerset and conveniently positioned for experiencing some of the best that this county has to offer. The delightful town of Wedmore is just two miles away and boasts popular pubs coffee shops and specialist shops. You will have a vast choice of walks virtually on the doorstep plus cycle routes or perhaps bird watching at RSPB reserve Ham Wall eight miles away. Close to Wells with its famous cathedral and shopping area and Burnham-on-Sea with its golden sandy beaches seaside shops restaurants and Cheddar with its famous Gorge to the north. A perfect position to visit an array of places for all ages and tastes. On entering this converted stone barn you are met by an open-plan kitchen/diner which overlooks the courtyard and has many character features which include exposed beams and some exposed stone walls. The kitchen area is perfect for lighter meals and has an electric oven and hob microwave fridge with ice compartment washing machine and dishwasher. This leads to the lounge with woodburner (first basket of logs included - further can be purchased from the owner) where you can relax with a good book or take time to watch your favourite TV programme. There are two bedrooms one double with a door to the pretty cottage style garden and one twin bedroom. There is also a shower room with shower and WC. Venturing outside from doors either in the lounge or double bedroom you will find yourself on the private and secluded terrace a perfect place to enjoy a glass of wine or some outside dining with garden furniture. 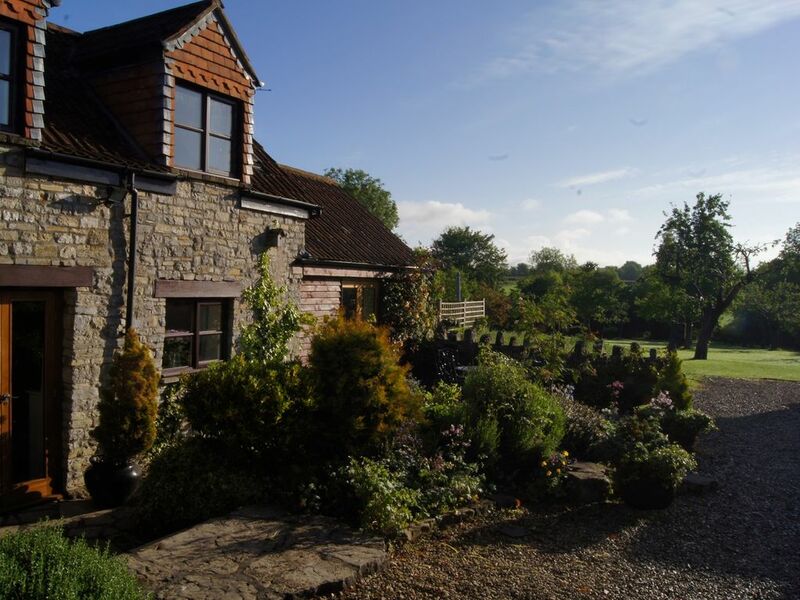 Here you will also find a cottage style garden shared only with the neighbouring property. To the front of the property and accessed via French doors in the lounge is a private terrace with seating. You are also welcome to use the mature orchard which leads down to a stream which is a perfect place to enjoy beautiful sunsets in the late summer evenings. There is also off-road parking for 1 car (further by arrangement) approximately 50 yards from the property along a level path.